A two bedroom top floor maisonette situated on the Scotts development and offered to the market with NO UPPER CHAIN. Offering entrance hall, lounge, kitchen, utility, bathroom, GARAGE situated in a block and communal garden area. THIS WOULD MAKE AN IDEAL INVESTMENT OR AS A FIRST HOME. UPVC double glazed door, stairs rising to first floor. 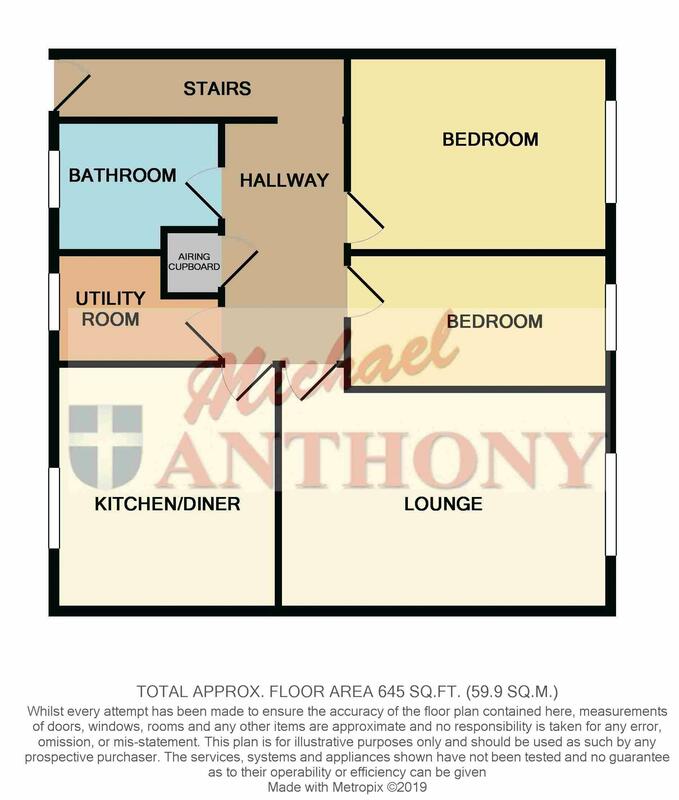 Access to loft void, radiator, doors to lounge, kitchen, utility, bedrooms and bathroom. Double glazed window to rear aspect, radiator, television point, laminate wooden flooring. Double glazed window to front aspect, radiator, a range of storage cupboards at base and eye level, work surface areas, stainless steel single drainer sink unit with mixer tap over, splash back tiling, spaces for a cooker and fridge freezer, wall mounted boiler, laminate wooden flooring. Double glazed window to front aspect, space for a washing machine. Double glazed window to rear aspect, radiator, laminate wooden flooring. Frosted double glazed window to front aspect, a three piece suite comprising a panelled bath with electric shower over, pedestal wash hand basin, low level w.c., laminate wooden flooring, part tiled walls. Single garage situated in a block with up and over door. To front of property, mainly laid to lawn with mature trees.